Today’s show got a little heated, it’s true. We went over a lot of things, but none more than a recent campaign to try and get more young women interested in engineering…in a not-so-great way. We welcome all debate about the issue in the comments or a link to a discussion elsewhere. We also covered a lot of other industry thoughts. On all these topics, please be sure to let us know if you like the direction the show is moving or not. We just like hearing from you. (Found on Hacked Gadget’s humongous list of links) Tech Dirt is a great site for a lot of internet type issues…just be careful, it’ll make you really mad at lawyers and entitled-feeling people around the world. The example story is about professor who says 24 hour news should get protections so people can’t link to it. NEWSFLASH: The internet is good for weirdos like Dave and Chris and bad for people trying to make money the same way newspapers were run 50 years ago. Kickstarter…is awesome. Crowdfunding/microfunding for all types of artistic and technical endeavors.The new Lasersaur project was funded ($20,000!) through Kickstarter. Be sure to click through and check out all the awesome projects that are on the horizon. You can help fund them and maybe get a cool souvenir. Chips are still hard to get! Dave mentions that the big distributors such as Digikey and Mouser seem to be keeping up though. We also point out the importance of designing with part availability in mind. Money trickling back to chip startups. There will always be money flowing to where venture capitalists can see a return on their investment. The real problem is bootstrapping a chip start up is next to impossible so funding is one of the only options available. We also referenced the reader comments from last time concerning making 10 micron feature size chips at home and encouraged people to give it a shot. Who are we to say what people can or can’t do. Margery Conner (EDN) links us through to a theregister.co.uk story about the cluelessness of people who want to “go green”. It’s amazing how little people understand about the scale difference of mW, W, kW and MW. Design News is just announcing the TI launchpad. Is the hobbyist industry going to lead the professional industry? 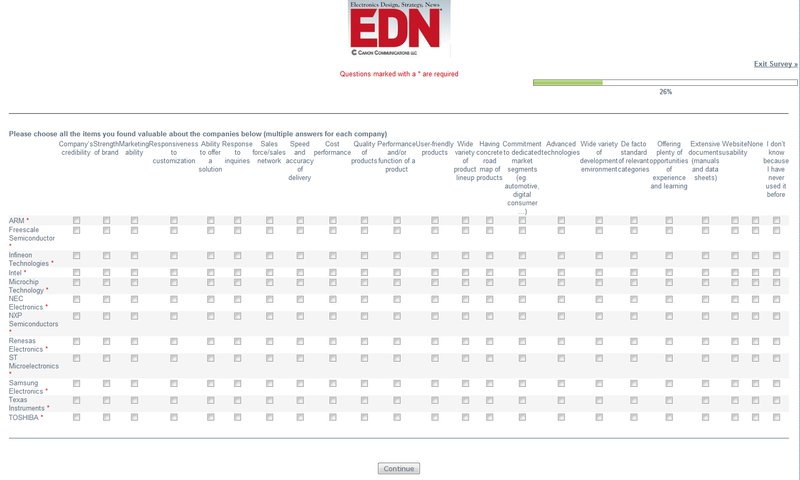 Dave dislikes the EDN Survey, done by Canon Communications and KMPS group. Why do they do surveys like that? A horrible concept for a new reality show about women in engineering. Women shouldn’t need to be enticed with “style” to buy into engineering. That just makes it stereotypical, regardless of women wanting to preserve “identity”. They should encourage young women with programs like MAKE, encouraging curiosity in the sciences from a young age. Instead, show women regardless of how they look or dress doing really awesome things! Model it off people like Jeri Ellsworth and Kari Byron. Focus on what you can do with engineering and sciences, not that it needs to be “stylish”. Why do the people closest to the money get paid the most? Is this a fundamental problem with engineering (salary at least)? At Jeff Keyzer’s request (talking about projects): Chris’s idea for a simple temp controlled wire (DC based, no AC supplies so we don’t need relays). Basically just a copper wire with known resistance and a power FET (or many paralleled FETs) with a PID controller. Saw that Lady Ada built a PID for their reflow oven so that could be a good starting point. No updates on Dave’s mysterious project! Transformers vs. switchers. Are the former headed out? We don’t want to say “the transformer is dead” of course…we’re not Chris Anderson talking about the web or anything (sorry, couldn’t resist! )… But there seems to be more focus on the switching side of things because of portability of devices. What’s even more annoying is when businesses develop a product and then fire the majority of their engineering staff and keep only a couple people on for tech/maintenance. About the whole switching vs. transformers: I know how to do one from scratch, but the efficiency was LAME, knowing how to do “high power” (3-10 amps) DC-DC converters with a regulator is basic stuff, doing a switching power supply from scratch is an interesting topic, but I don’t have the time. And about the MCU vs. analog circuitry: I have been thining of doing a sine VCO and doint it analog was the idea (a wienner bridge of some sort, or a triangle with a “sine conversor output”) but doing it thermally stable is so damn expensive ($200 for a thermistor!!! thermally coupled transistors acting as diodes, uff), so maybe I’ll use a MCU + filter and end of story, what do you think?. From what I’ve seen/heard, it is unfortunately easier to do it in digital. However, in terms of speed and accuracy you’re still better off in analog. Had a look at that nerdgirl thing. OMFG. Yes, the casting result is predictable. I totally agree with Cherish about the whole “not being valued” thing. I find these days that VC driven companies see engineers as nothing more than a commodity. Once you’re “spent”, you get tossed. Nothing else matters… not your years of experience that could be offered to build up valuable IP inside the company… not all the effort you put into your designs, day after day, night after late night… etc. You’d think H/W design (I can’t comment on S/W) was just a piece of cake somehow… Wait until no old guys are around any more and see how technology’s progress flattens out. Then, we’ll see where it all goes and how commoditization of specialized skill sets puts everyone back in the dark ages. Good luck world!